Next Monday, the House of Commons will consider the multitude of amendments made to the Bill in the Lords – getting on for 500, by my reckoning. If it accepts all of them, then the Bill will go on to enactment – the Queen has a bill-signing session booked for 15 November. If it rejects any, these will have to go back to the Lords for them to agree not to insist on the amendments being made. It is not possible to introduce new amendments at this stage, although if the two Houses disagree, amendments that represent a compromise between the two positions could be introduced. It is unlikely that there will be any great disagreement between the two Houses, and so we are likely to see the Localism Act 2011 emerge in two weeks’ time. Waverley fights to protect the future of Waverley by urging town and parish councils to respond to a controversial Government consultation. The growing national debate about the Government’s controversial planning policy has prompted Waverley’s Leader of the Council, Councillor Robert Knowles to urge the Borough’s towns and parishes to respond to a national consultation. If the suggested national planning policy is adopted, the proposed presumption would favour all new house building proposals. There would also be a requirement for Waverley planning committees to allocate an extra 20 per cent of housing on top of its existing plans for the building of new homes. This proposal has been described by Cllr Knowles as having ‘very serious consequences for boroughs like Waverley’ and comments that it would mean that ‘more new development will take place than our residents have told us they want’. Preserving the quality of the borough’s environment and improving the lives of its communities are key priorities for Waverley. A detailed objection to the threat presented by the draft policy was debated by Waverley’s Executive on 4 October and at a meeting of the Full Council on 11 October. Download Annexe 4 to the Executive Minutes – 4 October 2011 – NPPF Response. Campaigners said the disclosures appeared to confirm fears that the Treasury hijacked the planning reforms over the summer to help boost economic growth, at the expense of protecting the environment. Figures show that four officials from the Treasury were seconded to work on the development of the draft National Planning Policy Framework. In contrast, a single official from the Department for the Environment, Fisheries and Rural Affairs worked on the reforms. The framework distils 1,300 pages of planning guidance into as few as 52, and writes into the rules a “presumption in favour of sustainable development”, without defining clearly what it means. Groups including the National Trust fear that this will give developers carte blanche to build on large parts of rural England and have been fighting the plans. The Daily Telegraph has also launched a campaign urging ministers to rethink the proposals.According to Parliamentary answers, Richard Benyon, the environment minister, told MPs that just “one official led Defra’s engagement” with the Communities department over the changes “consulting a wide range of colleagues as necessary”. Justine Greening, the then-economic secretary to the Treasury, said this month that “four HM Treasury officials were substantively involved in its [the NPPF’s] development”. Last night Jack Dromey, the shadow planning minister, said: “With the economy stagnating and his austerity plan hurting but not working, George Osborne instructed his officials to rewrite the planning rules in a desperate bid for growth.“The result is a planning policy that will deliver chaos not growth and that puts the English countryside at risk. In September Simon Marsh, one of the original architects of the NPPF, publicly turned his back on the policy.In an article in The Daily Telegraph, Mr Marsh, acting head of sustainable development at the RSPB, complained that the original proposals had been warped and changed by those in the Government “who don’t place a high value on the environment”. The news came as it was claimed that more than 50 Tory-controlled councils are demanding changes to the NPPF.Waverley council in Surrey describes the NPPF as a “developers’ charter”. When asked earlier about how many DCLG officials had been assigned to work on the practitioners draft the answer was zero – part from ‘secretarial support’. The National Trust’s Key #NPPF Requested Changes – How Might the Government Respond? As you may know we have been going through the responses of the major national groups responding to the NPPF to find out what consensus their is and how it might be changed, which is why its been rather quiet on here the last week or two. Though there is a small minority of groups who consider no changes should be made those that do want changes have asked for very similar ones in most cases. We have also, since before the consultation ended, been developing an alternative draft of the NPPF that tries to forge consensus around the principles of Smart growth – more housing and employment development yes but in the right place and built truly sustainably. Now having gone through the main national groups responses we can now see the scope for achieving resolution of this dispute. The National Trust’s response is as much concerned with tone and the overall thrust of the government’s reforms but it does make a number of specific requests for changes. Critically the Trust does not seek to question the need for more development, nor does it seek a ‘neighbourhood veto’ in the local plan process (one of the 10 ‘asks’). On that basis are its specific concerns realistic? After having gone through them in some detail I consider they are. They are very similar to what many other groups have requested and in many cases are easily fixed. 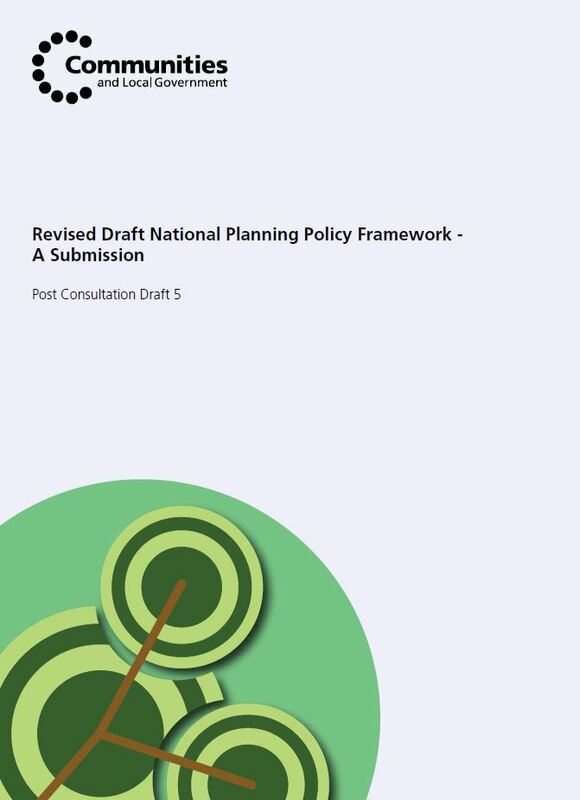 In one or two cases the issues raised misunderstand the legal position or the extent of changes (or lack of them) from current national policy; but this is common to all of the major responses and the same criticism could be applied to a much greater extent to the original consultation draft NPPF. In the majority of cases the issues the trust raises are already tackled by the alternative draft wording, including changes also requested by other groups and made. Through this we have sought to show that both précis and positively can be achieved without the use of the clumsy and legally vague language imposed by treasury officials. In other cases we have highlighted specific changes to the alternative draft which may be able to meet their concerns. the ‘presumption in favour of sustainable development,’ while attempting to set a positive framework, is actually unacceptably tilted towards one sector of sustainability so that the necessary balance of factors becomes distorted and unable to fully and properly deliver the principles in either Brundtland or the UK SDS. The National Trust would .. support the encouragement of a positive, plan-led system (whether or not a ‘presumption is actually necessary) so long as the aim of achieving genuinely sustainable development is equally clear. A number of points are mentioned in the response which need to be tackled separately. The alternative draft recasts the presumption in what is hoped is a more workable and balanced way. Firstly the issue of the evidential burden. The consultation draft is very unclear on this issue and the government has subsequently in its mythbuster document stated that ‘All proposals will need to demonstrate their sustainability’ . This is the position taken in the alternative draft with clear proposals as to how it can be done and simplified through applicants presenting a ‘single statement’ with the application. Others can them argue differently, it is a level playing field on all sides. The alternative draft removes some of the careless and blunt language in the consultation draft that drew so much concern whilst retaining the positive thrust that the Trust accepts. Its position on the key decision tests when plans are out of date is based on that which applies under the 2008 Planning Act and indeed from caselaw to all cases, that assessment of cases should be based on the weighing of benefits and harm and where benefits outweigh harm a scheme should be approved. The alternative draft also clarifies, as does the NPSs supporting the 2008 Act that harm and benefits need to be ‘significant’ to be material, and of course evidenced. This adverb free formulation should be much less open to legal interpretation and uncertainty as it is based on current legal principles. Under current law where a plan has nothing to say on a matter or pulls in opposite directions so there is no clear steer then applications have to be decided on their merits having regard to all material considerations including national policy. The alternative draft adopts the same principles using them to provide greater clarity on what ‘silent’ and ‘indeterminate’ actually mean on the basis of current caselaw, and what happens when this is the case. It clarifies that a plan will only be indeterminate where there is no clear steer from the plan as a whole. In terms of when plans are ‘out of date’ the courts have determined that the age of the plan is not a material consideration, what matters is whether or not it is still relevant. This is because a brand new plan can be rendered no longer relevant by events the next day such as new national policy, and also very longstanding policy, such as a national park designation, might be more relevant than ever. Hence it uses the term ‘no longer relevant’ instead which may be triggered in certain circumstances when a plan is out of date. It is understood though that the Trust’s key concern is that of a default or almost automatic yes when these ‘planning in default’ considerations are triggered. The Alternative draft contains a number of key safeguards including the introduction of tests of balance and a ‘good planning test’ when this is the case. This would prevent for example a large housing site going on a poor site when a plan no longer has a 5 year supply, but rather the most sustainable site. Secondly the issue of ‘significant weight’ being given to the need to support economic growth. This was clumsy language. The alternative draft uses the ‘sustainable economic growth’ definition from PPS4 throughout. This means economic development would have to be sustainable by definition. At a time of economic recession it is considered reasonable that significant weight should be given to achieving sustainable development and sustainable economic growth, which because of their definitions would need to be comprised on development that takes a balanced and integrated approach to the three pillars. The alternative draft cross refers to the biodiversity chapter which contains a rigorous listing of all of those areas protected by European law and national policy, and hence where the presumption does not apply. The alternative draft requires evidence to be robust. The alternative draft allows for design based SPD. There is little risk of the phrase ‘environment’ being interpreted narrowly as the following list of evidence base requirements refers specifically to the historic environment. The alternative draft contains a different formulation of the viability sections which overcomes this concern. On neighbourhood planning there is some confusion here in that neighbourhood plans will form part of the development plan so there is no conflict with section 38(6). There were a number of aspects of this section which remained unclear however which are tackled in the alternative draft. For example it clarifies that more development than the local plan allows for is acceptable only where this complies with policies regarding infrastructure or restraint in the local plan – otherwise there would be a breach of the conformity test. The trust raises concerns about the use of language in this section such as ‘growth’ and ‘enhanced levels of development’ rather than ‘sustainable development’. The alternative draft has wording of this section which might be more acceptable. There appears to be a misunderstanding regarding neighbourhood development orders, an examiner can ask for whatever is necessary to make a decision on a neighbourhood plan/neighbourhood development order. Sustainable economic growth is a term from existing national planning policy PPS4, although the NPPF does not define it. The alternative draft retains the definition. This is clear that it means growth that is sustainable. The alternative draft includes offices within town centre first but allows local plans the discretion of designating other locations with good public transport as suitable for office development. this section is very largely focused on promoting short-term development rather than supporting good sustainable transport solutions. The alternative draft contains a completely redrafted transport section. The alternative draft cross refers to the strict test on designated landscapes which is the same as that in PPS7 and MPS1. Other NPPF policies on landscapes and biodiversity apply. Part of the concern may lie with there being no general policy on landscape protection in the NPPF. This is corrected in the alternative draft. They then go on to raise a number of specific concerns including over the ‘+20% rule’. NPPF para 109 is poorly drafted but our understanding from DCLG is that the 20% does not add to the amount of land that needs to be allocated, rather it is a frontloading of the release of land from that allocation. A clearer formulation of this principle is suggested in the alternative draft. The alternative draft contains a clear Brownfield first policy. It also retains a rural exceptions sites policy but allows local plans at their discretion to allow an element of affordable housing. The alternative draft contains a default threshold in case there is no up to date local plan threshold. They are free to vary that on the basis of the evidence. The National Trust welcomes the Government’s support for high quality and inclusive design, however we are concerned that the way the wording in PPS1 has been shortened will lead to a weakening in aesthetic control. At NPPF 118 the instruction not to impose “unsubstantiated requirements to conform to certain development forms or styles” is open to interpretation, especially as it is not balanced with the affirmation in PPS1 that it is proper to promote and reinforce local distinctiveness. Sensitivity to character and local distinctiveness are key principles that should be recognised. Where there is a strong local vernacular or a clear historical or architectural character contributing to a sense of place & local distinctiveness then plans and decisions should reflect this, including in neighbourhood plans and in design guidance on matters such as use of traditional materials and methods, however planning should always allow for innovation and creative design solutions that are sensitive to and add to local character. On minerals development it is a slight tightening of policy not a relaxation as PPG2 para 3.11 states that ‘Mineral extraction need not be inappropriate development’ now it would be subject to the ‘provided they preserve the openness of the Green Belt and do not conflict with the purposes of including land in Green Belt’ provisio. Following restoration they may certainly contribute to green belt objectives – for example improving nature conservation, as areas such as the Colne Valley and Lea Valley show. The test for engineering operations is exactly the same as in PPG2 para 3.12 – in fact it is a slight tightening of policy as it excludes ‘other operations’. Clarification is proposed for park and ride. The change proposed by the NT would actually be weaker than current PPG2 as there would no longer be a need to demonstrate a Green Belt location or to pass the openness test. The alternative draft includes reference to carbon sequestration in the objectives. The alternative draft includes string reference to river catchment management. This formulation is preferred as it applies to the whole coast not just coastal change management areas. Plans should identify as a Coastal Change Management Area, through use of shoreline management plans and other evidence, any area likely to be affected by physical changes to the coast, such as from climate change or erosion. The objectives of PPS1 iv) is adapted and repeated in the countryside chapter of the alternative draft. Planning policies should seek to protect and enhance the quality, character and amenity value of the countryside and urban areas as a whole. Great weight is the highest level of weight, as in PPG2 for Green Belts. The alternative draft correctly states the legal tests re National Parks and AONB. The alternative draft retains the presumption in favour of the preservation of heritage assets, as well as policy on harm that is less than substantial harm. It also includes a number of changes requested by English Heritage and other Heritage Groups. Too often projects get hobbled by planning restrictions, funding blockages or regulatory burdens. So this autumn the government is on an all-out mission to unblock the system and get projects under way. Today we give the green light to two power plants in the north of England – at Ferrybridge and Thorpe Marsh – which together will create more than 1,000 construction jobs. And we welcome another significant infrastructure project, with BT’s announcement that it will complete its roll-out of superfast broadband by the end of 2014 – meaning the recruitment of more than 500 engineers. Over this autumn you can expect to hear many more such announcements. Err neither of those two projects require planning permission. They have had applications under the Electricity Act – so any delay lies with ministers. In any event larger schemes now rest with the infrastructure planning commission under the 2008 planning act. A fast track system the government has decided to slow down not speed up by adding a final stage process of ministerial approval. So stop attacking the planning system Cameron, when jobs lie locked in your own ministers filing cabinets. We have continued to keep our proposed alternative draft version of the NPPF draft dealing with concerns raised by many bodies concerning heritage, biodiversity and transport issues, as well as cross cutting issues raised by the main environmental, transport, planning and property bodies. We have now gone through all of the main groups finishing with the National Trust and the CPRE. The aim has not been a lowest common denominator approach or worse a big tent approach accepting every change. Rather it has been looking for common ground and accepting reasonable amendments that clarify issues and neither add unacceptably to length or divert the thrust of a more proactive document. Ill post the NT issues as a separate post. Inevitably there were some suggested changes where they would have created legal problems or where they may have got the wrong end of the stick – these are set out. What we hope this means is that it should be possible to ‘fix’ the key issues by broad consensus, neither groups denies the need for housing and economic development, it is a question of how and where; leaving only the most difficult issues, concerning the ‘presumption’ and the duty to cooperate, for discussion. The next steps is to present this to these groups next week and then discuss with other parties. (Reuters) – Fourteen years after Beijing’s planned satellite city of Tongzhou rose from a small town with many scattered fields, it still lacks decent schools, hospitals and entertainment complexes that residents need to make it feel like home. Few of the people for whom Tongzhou was built — residents in overcrowded downtown Beijing — live there. Instead, thousands of young, middle-class and blue-collar migrants from poorer parts of China have moved in, contending with the lack of amenities and the daily jam of cars on the highway into Beijing, which now has a population nearly that of Australia’s. Far from being an easy fix to housing Beijing’s soaring population, Tongzhou and other satellite hubs in the capital have created new headaches for planners. “Everyone who has moved here from inner Beijing regrets it,” said a 52-year-old man surnamed Wang who has lived in the Tongzhou area all his life. Wang’s complaints underscore the plight of Beijing city planners and counterparts around the country, where China’s breakneck urbanisation leads a world set to reach 7 billion people by the end of the month, according to United Nations estimates, and 9 billion by 2050. Beijing is among the world’s most populous cities, though population rankings vary widely. It has swelled by about 10 million people in the past decade, a trend mirrored worldwide, particularly in developing nations. Cities in Africa, Asia and South America are bursting at the seams from migrants seeking better jobs or as farmers flee droughts, floods and other environmental disasters. In 1950, about 730 million people lived in cities. By 2009, it was nearly 3.5 billion and in four decades it will be 6.3 billion, the United Nations’ Department of Economic and Social Affairs said in a March 2010 report. By 2025, there will be 29 megacities globally with 10 million or more people, the report says, from 21 two years ago, with the majority in developing countries. Yang Weimin, a vice minister of the Office of the Central Leading Group on Finance and Economic Affairs, said that the tens of millions of China’s rural migrants boosting urban population could have “negative consequences for development”. “The big cities face big pressures, while the smaller and medium-sized cities lack enough industry to provide sufficient employment,” Yang, who has played a prominent role in China’s urbanisation policies, said at a Tsinghua University forum in Beijing on Saturday. “So, everyone goes to cities like Beijing, Shanghai and Guangzhou, and that creates problems,” he said, the influx adding to disparities in public services, education, healthcare and housing conditions. That explosive growth over-stretches limited resources and infrastructure and places megacities on a collision course with a predicted increase in extreme flooding, storms and rising sea levels from climate change, U.N. Habitat says. By 2070, almost all cities in a top-10 list of exposure to flooding risk will be in poorer countries, particularly China, India and Thailand. Even in China, with its wealth and vast infrastructure spending, some city administrations are struggling to keep pace. This year marks the first time half of China’s 1.34 billion population are classified as urban, pointing to the daunting tasks ahead for policymakers as they try to meet demand for services by an increasing wave of migrants. More than 100 million rural Chinese residents will settle in towns and cities in the next decade, according to a recent government report. Satellite cities such as Tongzhou were designed to relieve population pressure on Beijing. The government declared in 1991 it would build 14 such hubs on the capital’s outskirts. By 2020, the government expects the satellite cities to house 5.7 million of Beijing’s current 19.6 million residents, according to Beijing Municipal Planning Commission. Yet urban planning experts say China’s piecemeal attempts at reducing population density by moving people to satellite cities are not working. “Although the intention was to create new and independent economic and cultural centers, most of the satellite towns remain economically dependent on Beijing, and have only become dormitory towns,” Jeffrey Johnson, who specialises in Chinese megacities at New York’s Columbia University, said in emailed comments. In Tongzhou, clusters of drab high-rise apartments, many half-empty, dot the town 33 kilometres (20 miles) from Beijing’s city centre. Styled after faux European villas, some of the apartments’ facades have Roman columns and names like “New Village”. Johnson said satellite cities need to be developed far enough away from the urban core to encourage independence and discourage commuting. For now, that isn’t happening. On a weekday morning at Beijing’s Tiantongyuanbei subway station, an outlying hub about 21 km north of the city centre, thousands of commuters are crammed nose-to-neck. “Yeah, it’s annoying, it’s crowded. But it’s also our best option,” Zhang Yu, a 30-year-old make-up sales associate said, before plunging into the press of bodies. Her two-hour commute began with a 15-minute wait just to get to the station door. Population growth in China’s megacities outpaces growth in the country’s more moderately sized cities, according to a 2011 report on China’s cities published by the Chinese Academy of Sciences. China has between three and seven megacities, depending on different calculations, with several on the cusp. To ease population pressures, the Beijing government said it plans to move thousands of residents out of the city centre, has shut down schools for migrant workers’ children and ordered low-rent housing in underground shelters to be cleared out. Nationally, the government is encouraging the growth of cities inland as well. To accommodate the onrush of new city dwellers across the country, China will have to pave 5 billion square metres of road, construct 5 million buildings, including 50,000 skyscrapers, and add up to 170 mass transit systems, a report by consultants McKinsey & Co says. All by 2025, it added, when China would have 221 cities with one million or more people. Some countries need to build new capitals. Jakarta, Indonesia’s capital, is overcrowded with about 10 million people and growing quickly. The city is prone to flooding and rising sea levels, is sinking in parts because of excess ground water extraction, is chronically congested and is in an earthquake zone. The government has raised the idea of moving out. But building a new city means good planning is vital. Officials in Beijing said in mid-October the government plans to pump 10 billion yuan over five years into Tongzhou to connect it by highway to the international airport, and build a university campus and a children’s hospital, making it a “magnetic pole” for development. It might take more than that.